Heat a large soup pan on medium high heat. Add a little oil. Season the beef with salt and pepper. When the oil is starting to smoke, add the beef. 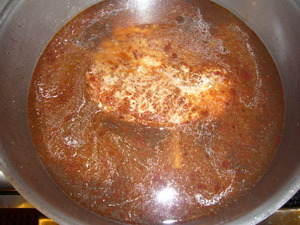 Allow to brown well, about 5 minutes, on each side. If possible, do the sides too... The fond on the bottom of the pan and the caramelized beef are both very important to flavor. 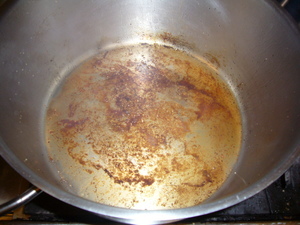 This should leave a nice fond on the bottom of the pan. Set meat aside. 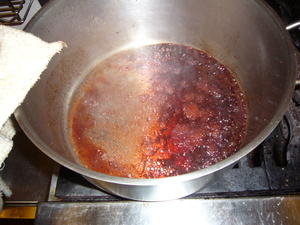 Deglaze the pan with some red wine. This will create a lot of steam. Be careful. Scrape up all the brown bits, and reduce the wine. 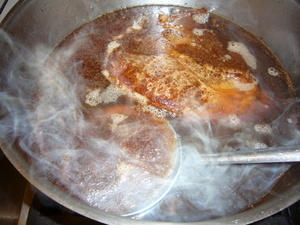 Return beef to pot and add stock and water. Liquid should just cover the beef. Obviously, homemade stock is best. 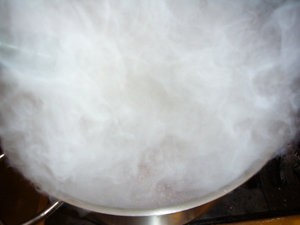 Bring stock to a simmer, just before a boil, and allow to simmer about a half hour. Skim scum from top of liquid. Add one coarsely chopped onion, two coarsely chopped stalks of celery, and the garlic. 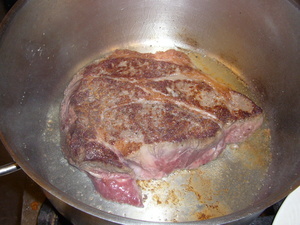 Return to a slow simmer and cook for 2 - 3 hours or until beef is tender. 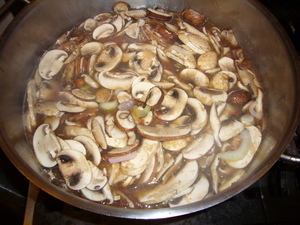 While soup simmers, slice the mushrooms. I like to use a mixture. 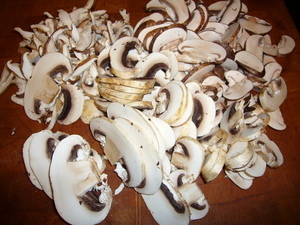 Here, I used shitake, crimini, and white. Trim the stems and throw them in with the beef while it simmers. Finely dice the remaining onion (here, I used some shallots sliced thin) and slice the celery. 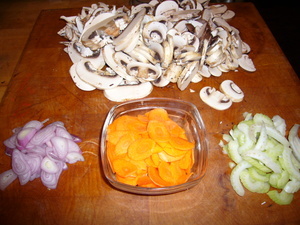 Finely slice the carrots (I used a small mandolin here). Set veggies aside. 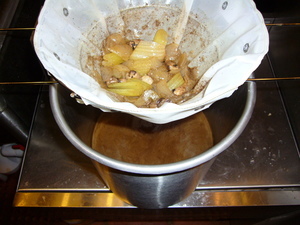 When meat is tender, remove meat to a plate, and strain stock using the finest strainer you have. Here, I'm using a reusable fine meshed filter designed for oil filtration I purchased at a restaurant supply house. Defat the stock if you can. Return stock to heat. 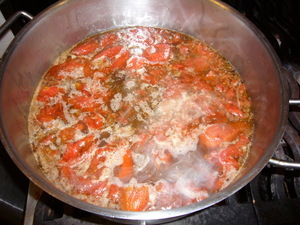 Bring to a simmer and squeeze the tomatoes into the soup. I take the whole tomatoes out of the can, and squeeze them till the fall apart into the soup. 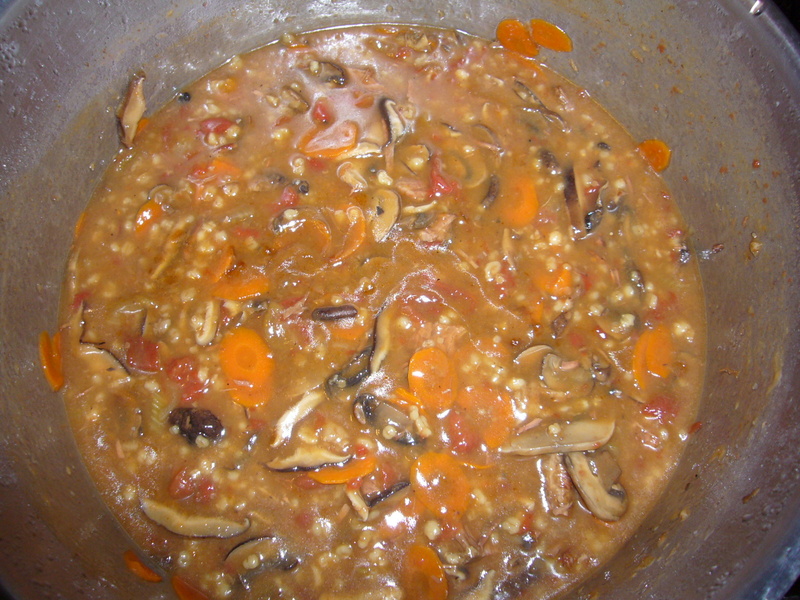 Add remaining ingredients except the carrots and the beef. 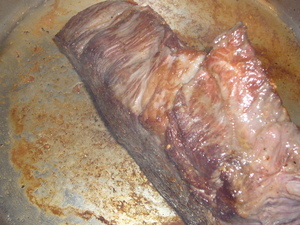 Cut the beef up into cubes of desired size. 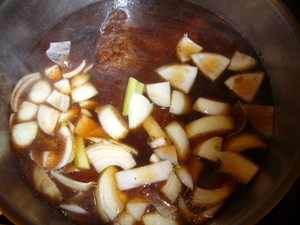 Return cubed beef to the soup and simmer for about an hour, or until the barley is very tender. If you're going to serve immediately, add the carrots and serve after about 5 minutes. This should benefits from sitting over night. If letting it sit, take off the head, allow to cool, and then add the carrots. 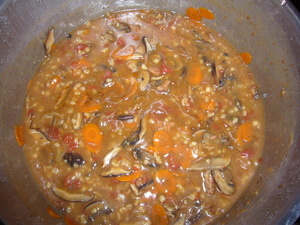 The carrots will cook quickly, while you reheat the soup. Enjoy.